L774VR – WaterSaver Faucet Co. Application: Point-of-use regulation of high purity gases for installation on fume hoods. Used for compressed air and inert high purity gases, including nitrogen, helium, argon and oxygen. Mounting: Pressure regulator / gauge assembly is surface mounted on front face of fume hood. Regulator assembly, valve and outlet fitting are piped together behind face of hood (pipe and fittings are not supplied). Gauge is installed on right side of regulator. Regulator: Non-relieving type with brass body and neoprene diaphragm. 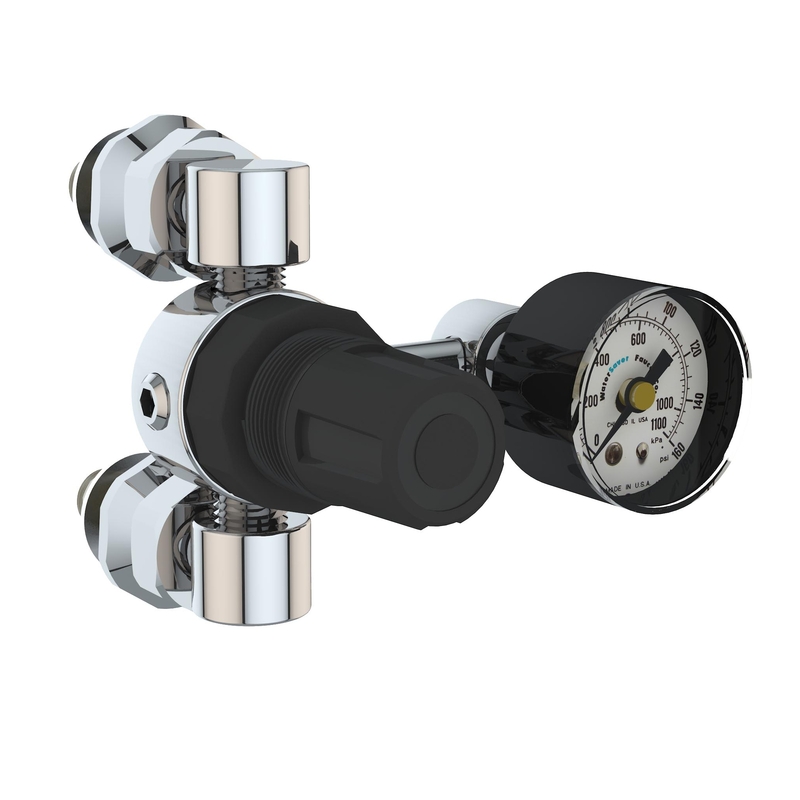 Regulator assembly is furnished with 1/4″ IPS mounting shanks, locknuts and washers. Inlet Pressure Range: 5-300 PSI. Outlet Pressure Range: 5-125 PSI. Quality Assurance: Regulator assembly, valve and outlet are fully assembled and factory tested prior to shipment. L774VL Same as above except with gauge on left side. Note: This pressure regulator fixture may be used with any WaterSaver remote control fine control needle valve and outlet fitting. Refer to pages 44-49 for information. Valve and outlet fitting must be ordered separately.